Our January kit contains materials to make creative electronics projects using paper, copper tape, LEDs and coin batteries. Using these materials, kids can make fun interactive projects that light up on paper. 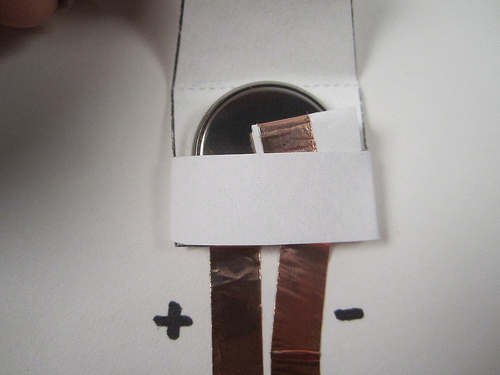 We’re inspired by paper circuit projects developed at the MIT Media Lab and found this great tutorial for making a paper battery holder. By printing this two-page template double-sided onto one sheet, you can print four battery holder templates. This video tutorial shows you how to make a paper battery holder for coin cell batteries (CR2032 and CR2016).